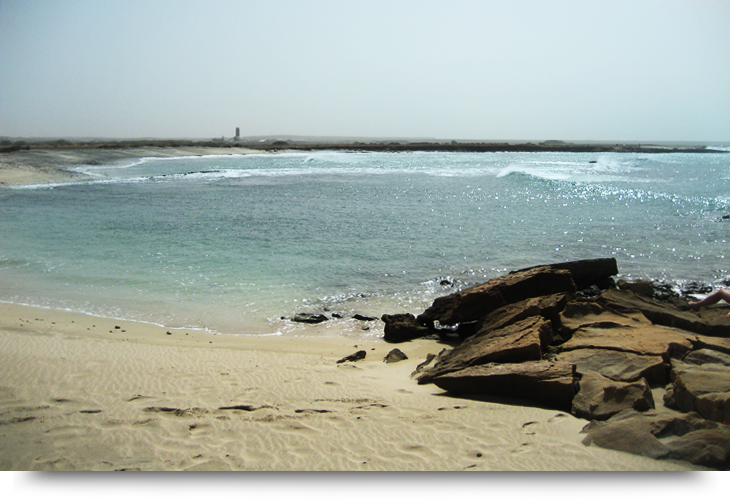 About 4 km north of Santa Maria town, on the west coast of Sal Cape Verde Islands, right along the island highway, is the small town of Murdeira. Get here by hiking, hitchhiking, rented car or moped / motorcycle or with the ocal bus. When entering this sleepy village of Murdeira, you will see a round beach protected from waves by the natural walls around it. There is also a restaurant right beside this beach. But don’t stop here. Turn left past the restaurant and follow the coastline down south by foot. You will have the powerful beautiful ocean on the right, and walk across the rocky coral stone shoreline, soon reaching another sandy beach, also naturally protected from waves. This empty beach is perfect for children. Take a swim and enjoy your privacy since you will likely find yourself all alone at this lovely spot. Murdeira is a growing village with a lot of speculation on properties and real estate, selling towards tourists and europeans wanting a summer house. The properties in Murdeira look fairly fresh and colorful walking around this cozy village although it feels a little empty. Not many people in sight! In a few decades Murdeira will probably have grown a lot and gotten more residents, shops and restaurants. Murdeira is a perfect spot for a daytrip on Sal, empty beach and very suitable for children.